We are engaged in providing Marble Carving Service to our clients. Empowered by a team of highly skilled and diligent craftsmen, we have been able to provide excellent services to our clients. We offer best surface finish with accuracy. 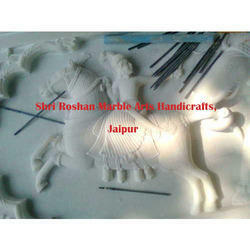 Marble from Rajasthan has been used for construction of famous monuments like Taj Mahal. Marble objects range from decorative plates to boxes and animal figures. White marble is painted, sometime with real gold. Even miniature paintings are done on marble. Jaipur is the main centre for exquiste marble objects. 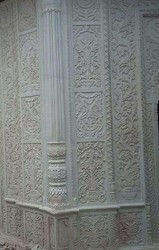 Marble Carving Service includes Masjid, Temple, Jain Temple Carving Work. this is my awesome product of makrana marble with carving.